I have been something of a baby lately. As you may know, I have been on a medical scavenger hunt for almost two months now. I have already endured numerous tests, trips to the emergency room, and visits to doctors and specialists. For as long as I can remember I have hated doctors. I may in fact have a slight ‘white coat’ phobia, despite all my doctors being lovely people who make me feel as comfortable as possible. The culmination of all these medical adventures of the last month reached a fevered pitch last week when I learned I would need even more tests to get a firm diagnosis on my pain. In a fit of very pouty and slightly tearful temper, I swore to never visit a doctor again – EVER! It is very safe to say I overreacted, and as of Tuesday (the day my funk officially ended) I booked appointments for both the unpleasant tests that I was refusing to undergo last week. The moral of this little interlude is as follows: The worst part of being an adult is submitting to things you would rather not do. The BEST part of being an adult is self medicating with baked goods (and a cocktail or two)! 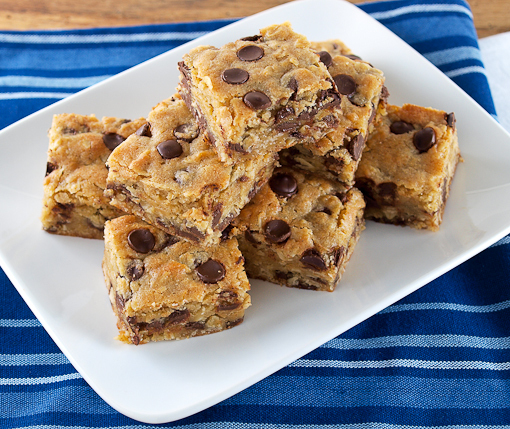 These provided me a great deal of ooey-gooey comfort, but I would make these even of I did not specifically need to find solace at the bottom of a crumb covered baking pan. These little beauties are loaded with unique flavors and textures. 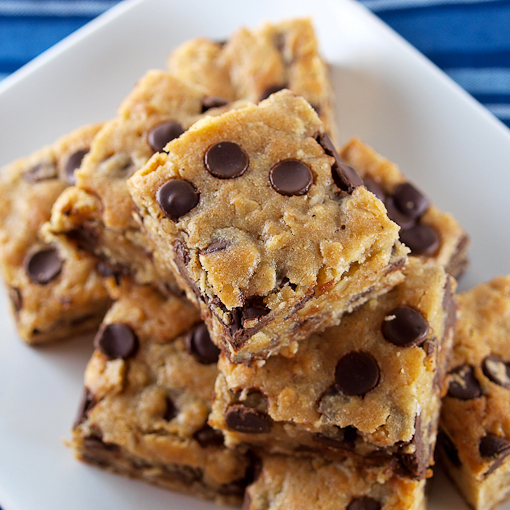 On the texture front you have the buttery soft bar, chewy rolled oats, and gooey melted chocolate chips. 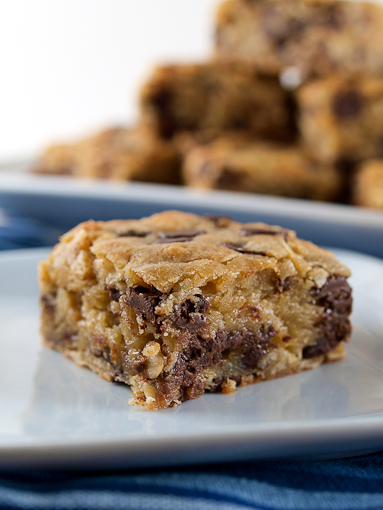 For flavor I added a little floral honey, which also serves to keep these bars extra moist, that combines seamlessly with the spicier flavor of the cardamom. One of my intrepid taste tasters suggested that some shredded coconut would be good in these bars, and I suspect he is right. 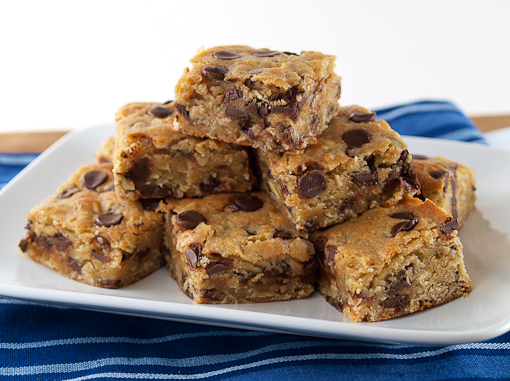 Really, you can add whatever you like to these bars, but for me some tempting bittersweet chocolate chips and hearty oats did the job quite nicely! 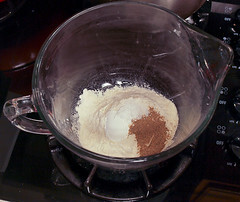 In a medium bowl combine the flour, baking powder, cardamom, and salt. Whisk until well blended. 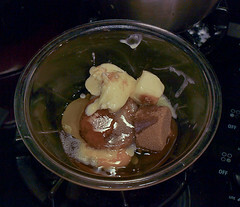 In a separate bowl combine the brown sugar, butter, vanilla, eggs, and honey. 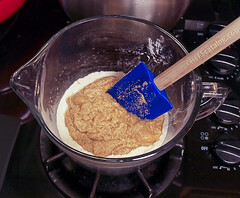 Whisk until well combined, then pour the wet ingredients over the dry and stir until just combined. The mixture will be lumpy. 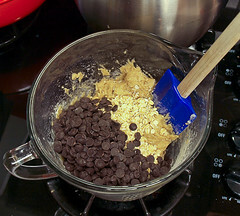 Add the oats and chocolate chips and fold to combine, about 5 folds. Do not over-mix. 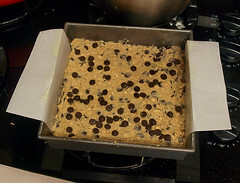 Spread the mixture into the prepared pan and bake for 20 to 25 minutes, or until the blondies are golden brown all over and puffed. 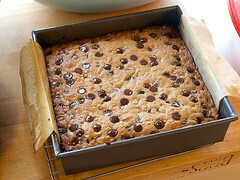 Cool completely in the pan then, using the overhanging parchment, remove the blondies from the pan and slice into 18 bars.